Classic engagement rings enhance the beauty of exceptional brilliant cut diamonds. Torsade, whose band evokes a ribbon or the frieze that curls around the Vendome column is embellished today with a solitary diamond. The Plume ring clasps the stone in its centre with delicacy, evoking the lightness of the feather motifs dear to Chaumet’s heart since the Second Empire. Bee my Love plays with the honeycomb motif evoking the Napoleonic bee while Frisson celebrates the thrill of love with a five-prong setting for its diamond. The Chaumet difference resides in these emblematic wedding collections that offer a large creative palette, so that every love story becomes unique. Thanks to a vast choice of settings and stones, , “Crown Your Love” gives couples the opportunity to create their own personal engagement ring, an immaculate and unique creation made just for them. The nine models can be adorned with certified diamonds weighing between 0.3 and 1.20 carats, and up to 1.7 carats for the Frisson collection. Only at Chaumet: couples can consult the GIA certificates of the diamonds on offer, starting at 0.30 carats and adding a tenth for a precise carat weight. They can thus choose their stone according to rigorous criteria that go beyond the traditional 4Cs to guarantee harmonious proportions and exceptional sparkle. The Chaumet offer combines the beauty and perfection of its diamonds, a large array of settings, emotion and jewellery expertise to make every wish come true. It takes just three to four weeks to receive the ring of one’s dreams. 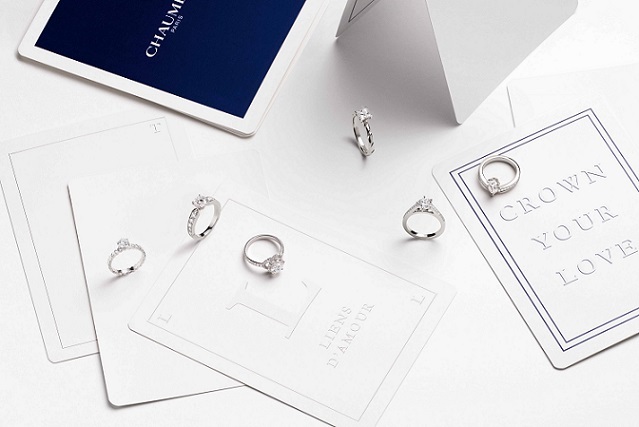 For Chaumet, solitaires and wedding bands are a perfect fit; each line has its own wedding bands for her or for him. 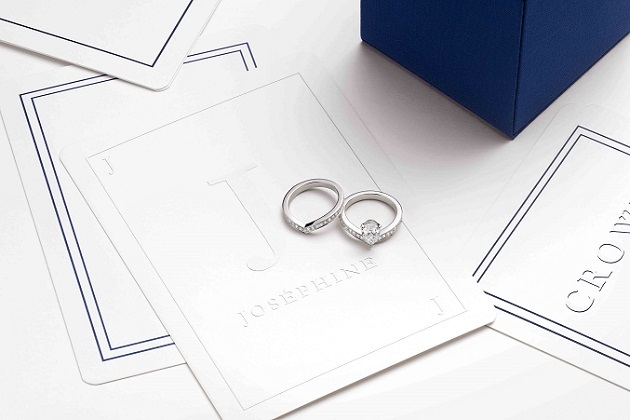 The signature collections have been enriched with a stackable wedding band; the iconic Joséphine takes on the V-shape of the aigrette, Liens curves to welcome the crossing ribbon motif and the graphic honeycomb structure of Bee my Love nests into that of its solitaire. Torsade and Plume also echo the lines of the collection. A selection of simple bands, Les Eternelles de Chaumet, offers pavé-set, rounded or bevel edged models. For men, the Liens wedding band expresses the discreet elegance of the esthete. The Torsade, Plume and Les Eternelles de Chaumet wedding bands have also been designed just for him. Heirs of the Chaumet visual codes, these pieces evoke style rather than fashion.